Over the past 3-years, GWO has successfully predicted months in advance the landfall locations of all 7 United States hurricanes! In the last decade, utter destruction and devastation from hurricanes have wracked the Southeast United States. Florida based prediction organization Global Weather Oscillations Inc. (www.globalweatheroscillations.com) has consistently predicted the landfalls of major storms like Hurricane Harvey, Irma, Maria and Michael with a laser-like focus, seemingly outsmarting other storm prediction organizations. For the last 10 years former NOAA Meteorologist Professor David Dilley has issued the most accurate preseason and in-season hurricane predictions, averaging a stunning 87%+ accuracy rate. Professor Dilley’s impressive forecasting caught the eye of the International Hurricane Protection Association (IHPA) and the two organizations officially partnered in 2017. The IHPA (inthpa.com) is the only professional association comprised of hurricane protection manufacturers, suppliers, contractors and associates dedicated to the protection of life and property from the devastation associated with hurricanes. Cited by media as the most accurate by any organization, GWO’s predictions were extremely precise in both 2017 and 2018. Professor Dilley predicted that both years would be very destructive, with two major impact hurricanes each year. Additionally, GWO predicted months in advance where the landfalls would occur. In 2017, major hurricanes Irma and Harvey made landfalls in Florida and Texas. In 2018, major impact hurricanes Florence and Michael made landfalls in the Carolina’s and the Florida Panhandle, all correctly predicted by GWO. To give some perspective, an average hurricane season has 12 named storms and six hurricanes. The past couple years have been extremely active seasons with the number of named storms and destructive hurricanes being well above normal. Professor David Dilley’s prediction for the upcoming 2019 hurricane season calls for a near average season when it comes to the number of named storms (13) and hurricanes (6). However – the upcoming hurricane season will likely be just as destructive and costly as the 2017 and 2018 hurricane seasons – with two major impact hurricanes likely this year. GWO urges everyone to monitor the upcoming season closely via GWO’s webinars and regional zone predictions – this is not a year to be complacent. Professor Dilley will discuss his 2019 Atlantic Basin hurricane predictions at the International Hurricane Protection Association’s 2nd General Meeting of 2019. The engagement will be held on the 17th of May in Ft. Lauderdale, Florida – right on the tail end of the Florida Governor’s Hurricane Conference in West Palm Beach. This conference will be an exceptionally informational meeting, with top organizations in hurricane preparedness in attendance. The IHPA extends an invitation for all media to attend and gain insight to the 2019 Hurricane Season. 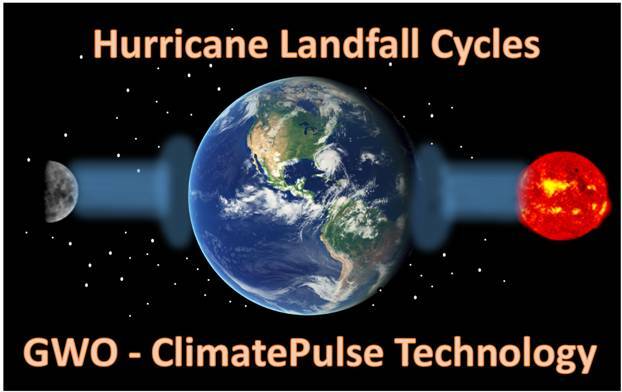 GWO will demonstrate their cutting-edge patent pending ClimatePulse Technology developed by Professor Dilley – it is this technology that separates GWO from all other organizations. For roughly 10 years prior to 2017, the US saw a relatively tame hurricane season year after year; why has the intensity and magnitude of these storms increased? Professor Dilley articulates that the reason for another dangerous season is because the United States is currently in a very active and dangerous hurricane landfall cycle that occurs every 70-years. Several regions of the United States Atlantic and Gulf Coasts are currently in an active landfall cycle. The current landfall cycle is much like the enhanced landfall cycles that occurred back in 1870s and 80s, and again 70-years later in the 1940s to early 1950s. GWO stresses that the number of named storms does not matter during an active cycle. What does matter however, is the number of landfalls. GWO expects two major impact hurricanes to strike the United States, on par for the course from 2017 and 2018. GWO’s patent pending technology predicted months in advance the landfall locations of all 7 hurricanes that struck the United States during the past three years. GWO can accurately predict six months in advance where the landfalls will likely occur this year. Their in-season hurricane outlook and tracking webinars provide enhanced readiness eight to 14 days prior to landfall. In 2018, GWO’s webinars tracked the major impact of Hurricane Michael four days prior to formation, and a full eight days prior to landfall on the Florida Panhandle. Additionally, GWO released their predictions in February of 2018 and accurately predicted that a major impact category 4 hurricane would make landfall in the western portion of the Florida Panhandle. GWO issues hurricane season predictions for 11 United States zones stretching from New England to Texas, and two prediction zones for the Lesser Antilles. The zone predictions detail what will occur in that zone during the upcoming hurricane season. The prediction notes whether the zone will have a hurricane or tropical storm, and if so, where it will likely make landfall within that particular zone. The predictions also indicate the likely strength of the hurricane. GWO provides additional lead-time preparedness with weekly Outlook Webinars that look two weeks into the future, and tracking webinars once a storm is projected to form. Be the first to comment on "2019 Hurricane Predictions – 2 Major Impact Hurricanes"